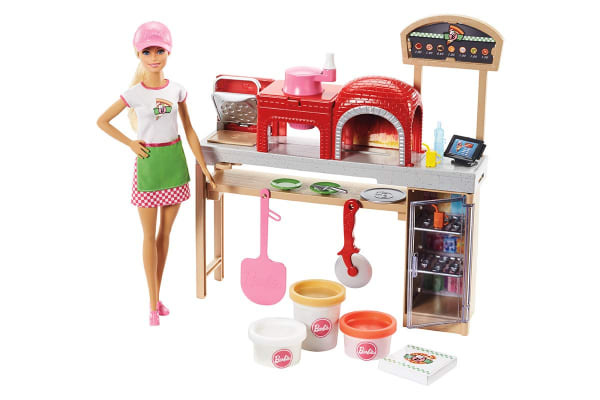 Barbie pizza chef doll is ready to cook up fun with a pizza shop playset, three colours of dough and accessories that let kids make their own doll-sized pizzas! 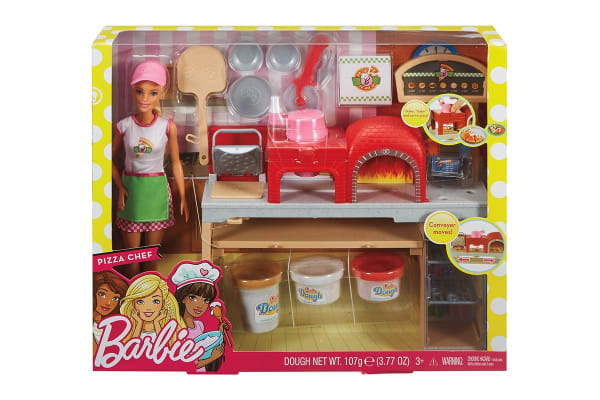 With the Barbie Pizza Chef Doll and Playset, young foodies can press the dough, add sauce and cheese, then slice and serve once they’ve collected payment at the register. A sliding conveyor belt keeps the food and imaginations moving on this pizza maker. Start with the beige dough and the tomato-coloured dough: use the pizza press to flatten a pizza crust and sauce on the conveyor pan. Slide the belt lever and the pizza along until it rests under the cheese grater. Add cheese using the white dough: press into the shredder and once the grater is locked into position, turn the hand crank to sprinkle the topping onto the pizza. Then, move the lever again and slide the pizza into the oven with its fiery backdrop. When you think it’s done, use the pizza slider to move the pizza onto its pan and cut it up with the pizza slicer. Serve a slice up on a plate (there are two) or place it in the pizza box for take-out. With so many fun features and pieces, this pizza shop play set offers all-day play and a world of exploration.